1. Real-Time BlackBerry Productivity Tracking and Reporting - With our unique ability to track real-time utilization of each mobile user based on time of day and day of week, we can now calculate off-hours productivity gains in real financial terms. 2. 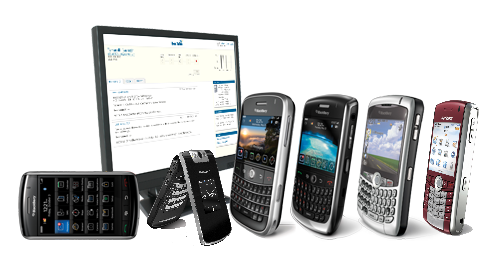 Controlling Employee Device Invasion - The major cost saving trend sweeping the industry is employee purchased devices, but that creates complexity and risks for IT. So with BoxTone 5.0 we've added device ownership tracking (employee-liable vs. corporate-liable) so that companies can auto-discover, identify, track, ensure IT Policy compliance, and protect themselves from rogue devices and applications. 3. BoxTone Expert Connected - BoxTone Expert (formerly called myBoxTone) is now optionally connected back to the BoxTone 5.0 server mother-ship, so BES Admins can get all kinds of remote data like detailed data usage and application tracking. 4. Roaming and Data Overage Tracking and Reporting - Leveraging Expert Connected and the productivity tracking above, BoxTone 5.0 now tracks detailed roaming and data plan overage details. A company can quickly identify pockets of wasted spend and take action. 5. Expanded User Self-Service - We had BoxTone Expert before as our on-device User Self-Service capability. Back in August we announced the BoxTone Portal -- our new web-based User Self-Service Module that BES Admins can deploy so that users can help themselves. Boxtone provides support mostly for BlackBerry devices, however they can toss in a few iPhones or WinMo's into the mix as well. For more information, check out boxtone.com/release50.